The ultimate in counterculture coolness since the late 1960s, skateboarding has made an irresistible subject for movies thanks to its rebel-athlete superstars, SoCal slacker fashion, and jaw-dropping four-wheel acrobatics. This series features the best of skateboarding on screen from the 1960s to the present, including films by Stacy Peralta, Spike Jonze, Larry Clark, and many more. Leif Garrett stars in this awesomely retro ride through 1970s skateboarding culture. It’s West Side Story on wheels in this Josh Brolin-starring piece of 80s cheese. One of the earliest records of skateboard culture, featuring Stacy Peralta and Tom Sims. Christian Slater sports a rebel hairdo in this skatesploitation classic. This terrifying film explores the dark side of skateboarding’s commercialization. This punk rock-inflected documentary/fiction hybrid captures East German skateboarding culture. A touching snapshot of aimless youth creating meaning and happiness amidst uncertainty. 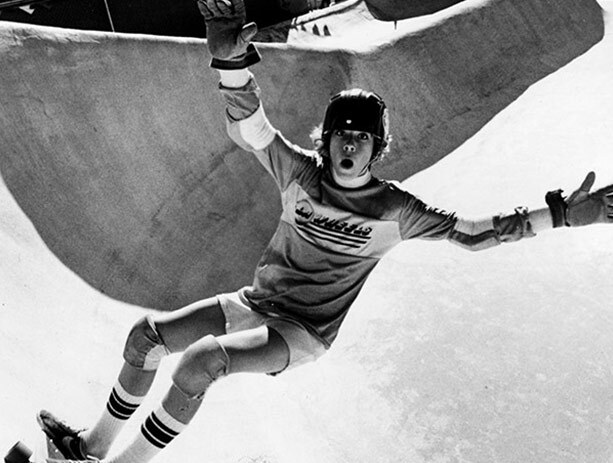 Narrated by Sean Penn, this high-adrenaline documentary is Hoops Dreams for skate rats. This documentary follows skating stars as they contend with the pressures of fame. This follow-up to Dogtown and Z-Boys features greats like Tony Hawk and Steve Caballero. This documentary captures a daredevil skater’s quest to jump the Great Wall of China. Spike Jonze captures skateboarding culture with his trademark verve and inventiveness. This elliptical coming of age tale follows the summer antics of Serbian slacker skaters. This beautifully shot drama captures a summer in turbulent modern-day Athens. This Harmony Korine-penned film is one of the most controversial films of the 1990s. Gus Van Sant's prize-winning, atmospheric tale of a teenage skateboarder. Heath Ledger stars in this gritty biopic of skateboarding phenoms The Z-Boys. This 3-film program includes the very first skateboarding movie ever. This ultra-camp oddity reworks the Greek myth as a skateboard rock opera.